Bombardier Global 5000 private jet. The private jet Janine Iannarelli is selling for a Russian client has leather seats, wood paneling, a satellite phone and can fly nonstop from Tokyo to Los Angeles. The price has dropped $3 million since September and is still falling. Iannarelli today is hawking the 10-year-old Bombardier Global 5000 for $14.5 million but recommends that her client cut the price further as the market for large-cabin business jets keeps weakening. A new Global 5000 lists for $50.4 million. Rarely seen bargains abound for big corporate aircraft as tumbling oil wealth, a stronger dollar and a downturn for emerging-market giants from Brazil to Russia cripple demand. 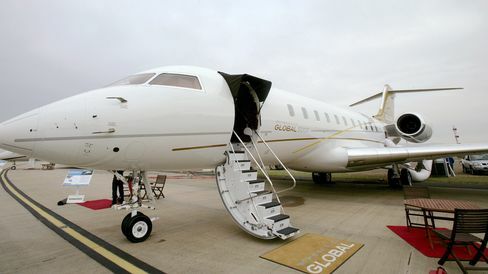 As owners from foreign tycoons to Archer-Daniel-Midlands Co. try to sell their planes, Bombardier Inc., General Dynamics Corp.’s Gulfstream unit and other planemakers are cutting output and chopping list prices to cope with a glut of new and used business jets. The slump extends even to the Gulfstream G650 -- just two years ago an aircraft so coveted by well-heeled buyers that some would pay $10 million above list for a used jet rather than wait four years for a new model. Now there are 19 G650s for sale, about 11 percent of the global fleet in operation. One 2013 plane that first was posted for sale in June at $68 million has had its asking price cut twice, to $58.8 million. “It’s probably one of the best times I’ve seen in my career to get the values for a big-cabin jet,” says Brian Foley, a business-aircraft consultant who spent 20 years as director of marketing for the North American jet unit of France’s Dassault Aviation SA. That marks a turnabout from the 2008-09 recession, when large planes -- some spacious enough to let almost 20 people roam around -- weathered the storm better than smaller jets, which cram as few as five passengers in too tight a space to stand up. Sales of bigger aircraft jumped with the economic surge of Brazil, Russia and other developing countries, plus a jump in oil prices and a commodities boom that fed China’s surging exports. Now, with many emerging markets faltering, oil companies trimming costs and commodities prices trending down, the tables have turned. Prices of used, large-cabin business jets fell 16 percent last year, according to AircraftPost Inc., which compiles data on the industry. 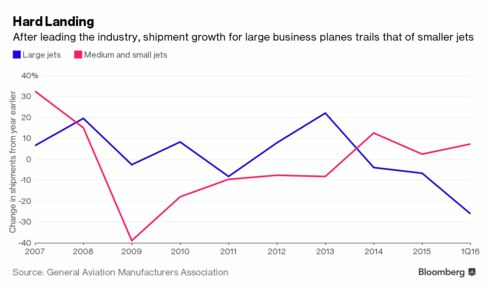 Business-jet sales tumbled 16 percent to $3.53 billion in the first quarter, the biggest drop in almost five years, according to the General Aviation Manufacturers Association. Large-cabin jets led the decline. Gulfstream, which is based in Savannah, Georgia, has reduced production and prices of its G450 and G550 models but doesn’t intend to cut prices for new G650s, said Phebe Novakovic, chief executive officer of parent company General Dynamics. The jet remains a “hot plane,” with about a two-year wait for a new one, she said on a conference call last month. Wynn Aircraft II LLC wants to unload an extended range G650ER that sells for more than $70 million new. A spokesman for Wynn Resorts Ltd., the casino company run by Steve Wynn, declined to comment on the sale. ADM is selling a 2010 Dassault Falcon 7X for $25.5 million in an effort to reduce executive travel expenses. “Commercial airlines offer options for long-range, nonstop flights which can provide significant savings on our overall costs,” says Steve Schrier, a spokesman for the world’s largest corn processor. General Electric Co. is selling a 2003 Gulfstream G550, part of an effort to shed assets of its finance unit as the company focuses on industrial operations. The price on a 2008 Gulfstream G550 registered to Gulf States Toyota Inc., a Houston-based car dealership, has dropped $750,000 to $24.95 million in about six months, according to plane broker Mesinger Jet Sales. Prices have dropped most sharply for older models, says Neil Book, chief executive of JSSI, which manages 1,800 corporate, commercial and private jets. A Gulfstream GV -- one of the largest, longest-range corporate jets -- fetches about $10 million now, down from $18 million two years ago, he says. Bombardier has been the biggest culprit for the drag on prices, analysts and consultants say. The Montreal-based company overproduced business jets last year and has been discounting heavily to raise cash as its grapples with a C Series commercial-jet program that’s over budget and behind schedule, according to Varsano and Rolland Vincent, an aerospace consultant in Plano, Texas. Bombardier jet prices have been helped by the company’s decision to cut output of large-cabin planes last year, says spokeswoman Anna Cristofaro. She declined to comment on production rates. Vincent estimates the company will produce about 50 Global jets, down from 80 last year. With the large price gap between new planes and late-model preowned jets, it makes less sense for buyers to purchase aircraft straight from the factory, says Iannarelli, the broker trying to sell a Russian client’s Bombardier Global 5000. That may put pressure on original-equipment manufacturers to discount further.